Imagine being asked to lend your dining room table to someone who wants to use it as a makeshift operating platform. When people know it is Wildlife Vets International (WVI) who need it, you might actually get a 'yes' in answer to that pretty outrageous question. I was fortunate enough to see them in action in the Hwange area of Zimbabwe where they were vaccinating domestic dogs in an effort to stop the spread of the Canine Distemper Virus (CDV) and Rabies. These killer diseases are a huge threat to the African Painted Wolves or Painted Dogs as they are also known. In 2017, pretty much the entire population of Painted Wolves in Laikipia, Kenya were wiped out by CDV (though other factors may also have played a role), whilst one of the Hwange packs succumbed to Rabies. For a species on the brink of extinction, listed on the IUCN list as endangered, losses like these are catastrophic. Some years ago, Steve Leonard, Patron of both Painted Dog Conservation (PDC) UK and of WVI introduced the two charities to each other so that, as he put it,"one could help the other to conserve this iconic creature". 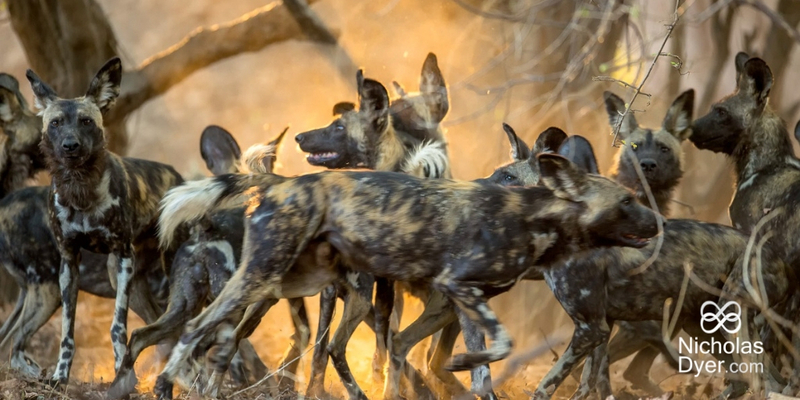 This led to the construction of a veterinary clinic at the Painted Dog Conservation headquarters in Zimbabwe which now forms part of PDC's excellent rehabilitation facility. After an outbreak of CDV in 2010, WVI vet and patron Brig. Tom Ogilvie-Graham went out to support PDC with the first of the mobile vaccination and minor injuries clinics for the local domestic dog population to reduce the risk of cross-infection in an area where endangered African Painted Wolves range close to human habitation. Many of these clinics have followed. Whilst WVI source vaccines and drugs of the kind you would give to dogs in ordinary small veterinary practises, PDC deal with logistics like advertising and securing the aforementioned tables. On the day, they provide help with everything from managing the dogs, translating conversations with the owners to preparing the picnic lunch that keeps the vets going. Overall in charge is the regional vet of the Zimbabwean State Veterinary Department, currently (2018) Dr. Dube, whose technicians carry out the vaccinations whilst he himself also performs surgeries if his time permits it. 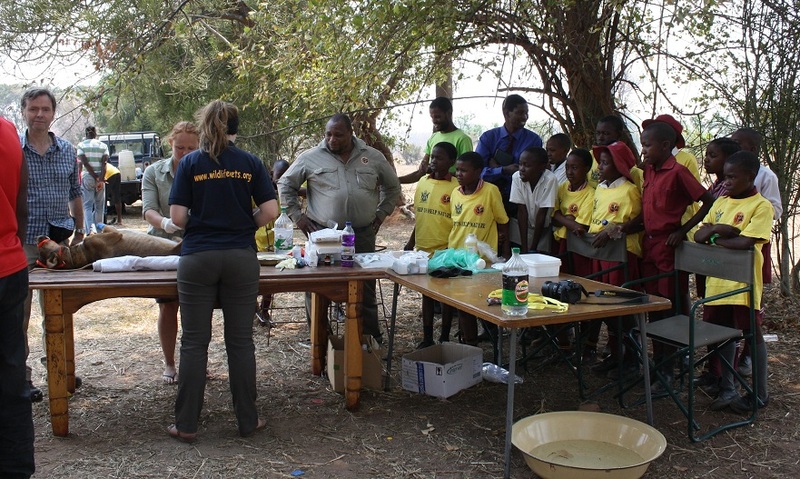 Helpers from PDC record the drugs and vaccines which are administered under the regional vet’s direction as per Zimbabwean legislation. Forget what you have seen when you took your dog to the local vet - these clinics are held in communal fields or literally by the roadside with cars slowing down as they pass to see why there is a queue of people with dogs in all shapes and sizes. It is dusty and hot and the local children look on in fascination as the international vets and vet nurses operate from dawn to dusk. 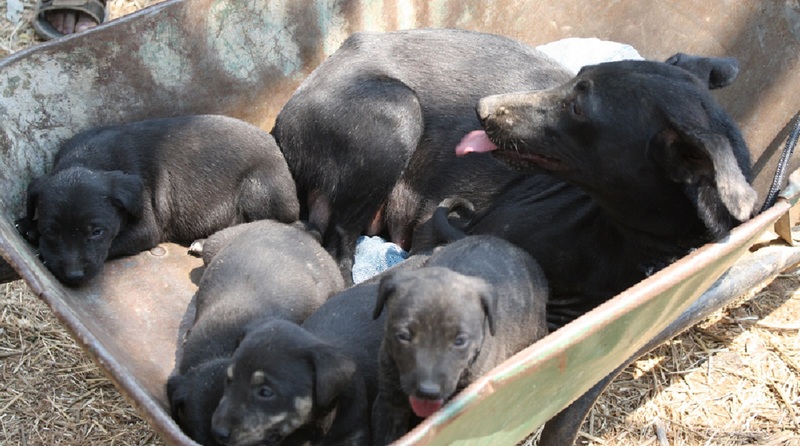 The dogs are mostly free-ranging, thus the neutering service WVI offers at these clinics helps to keep the dog population numbers under control. The vast majority of owners would never be able to afford these kinds of operations. In some cases, dogs are brought in requiring other types of surgery and the seasoned vets might need to mentor a newly graduated vet in dealing with a tricky case whilst in the middle of a neutering operation themselves. Many of these vets and nurses lend their expertise to WVI free of charge. The enormity of the job and limited funding availability initially decreed a program of bi-annual clinics, however by law, dogs should be vaccinated against Rabies on an annual basis. After an increase in the prevalence of the disease in the area, PDC added an in-between clinic this year, providing vaccinations only, and WVI will be back with the full neutering clinic again next year. You might ask, why not vaccinate the Painted Wolves instead? Although painted wolves have been successfully vaccinated in captivity, it would be extremely difficult to monitor the recovery process and deal with possible reactions to the vaccines in a large number of wild animals. With the increased risk of CDV outbreaks, however, some of the more heavily managed populations in southern Africa are now being vaccinated when they are being translocated between national parks. Currently, the only way to vaccinate against CDV is by injection. WVI are in discussion with colleagues around the world, trying to find alternatives and one option under review is the administration via spiked bait. Attendance at the clinics has grown year on year with the PDC Outreach team engaging the local village leaders. In 2018, a record number of dogs were vaccinated and the figures are expected to be even higher next year with numbers increasing from villages newly added to the program. Whilst castrating the male dogs is a quick procedure, for the female dogs it is a lengthy, quite invasive operation which can take anything up to nearly two hours, depending on the experience level of the vet. This does provide the team with an opportunity to teach the owners, usually men, about anatomy and women's health. When the vets have been able to give a dog with a transmissible venereal tumour a temporary lease of life, owners are very grateful although the dogs aren't always. Most will still try and walk home even though they have been under anaesthetic for over two hours. Getting all the funding in place is an annual headache for everyone involved. 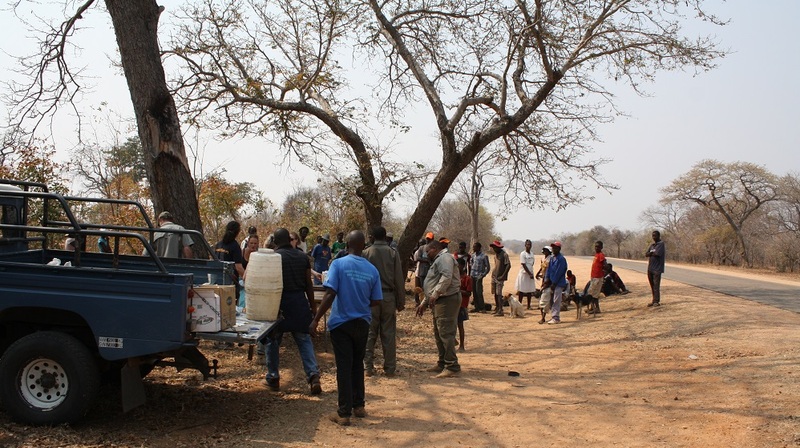 PDC pay for the time and materials to organise and run the clinics, WVI raise funds to pay international and Zimbabwean vet’s expenses and fees where appropriate and also try and help with the management costs - some of the vets give their time for free. Amongst those generously sponsoring WVIare Chester Zoo, Knowsley Safari Park, Yorkshire Wildlife Park, Painted Dog UK,as well as a number of individuals. The clinics generate a lot of goodwill in the area for the Painted Dog Conservation project and are likely one of the reasons why even villages outside their area of operations have heard of them and call them in to deal with the relocation painted of wolves in their area rather than killing the animals as would have happened in the past. 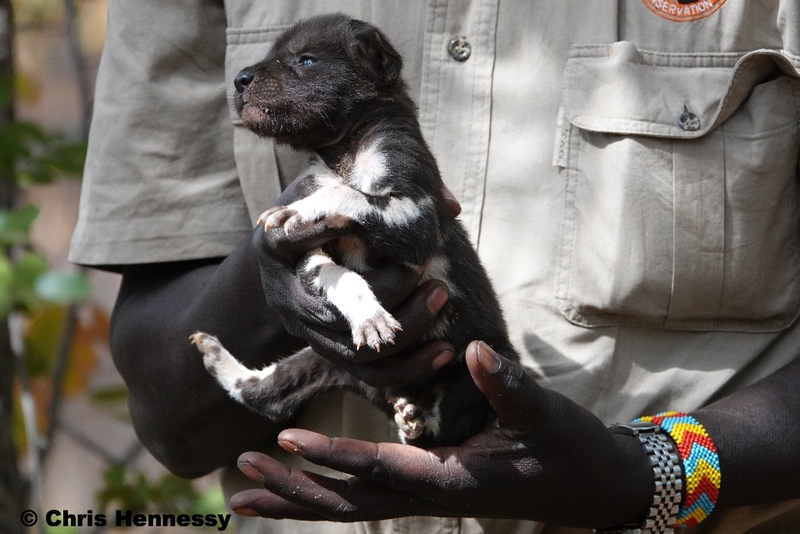 One of the pups from the rescued Pindo pack. It is difficult to estimate how effective the cover is in protecting the wild carnivores. Data collected by PDC, which compares the overall number of dogs in the villages with the number vaccinated, shows that the rate in communities where the vaccinations are well established was over 70% this year, bringing them within recommended epidemiological limits. The percentage in the newly added villages however is still much lower. Unfortunately, in 2017 and 2018, a shortage of Distemper vaccines meant that only Rabies vaccinations were administered. It is hoped that CDV will again be included in 2019, especially as it also contains vaccines against other canine diseases such as Parvovirus. I asked Olivia Walton, executive director of WVI, what the plans are for the future. If funds can be secured, she said, then the priority will be to ensure a minimum of 70% vaccination coverage throughout the PDC catchment area, followed by a gradual expansion outward. WVI are raising funds for the clinics in the Big Give Christmas Challenge this year, which will see all donations matched by the Big Give sponsors and, speaking with Derek Fry,Chairman of PDC UK, I was told that his organisation has already pledged a substantial amount towards next year’s clinic. In today’s human/animal conflict rich environment, the wildlife veterinary services WVI provide, are becoming more and more essential in the race to save endangered species, like the enigmatic African Painted Wolves,from extinction. The animals and WVI need your support. Donate to help us continue these clinics here.